The Quilt Trails of the Tar and Roanoke Rivers encompasses seven counties. 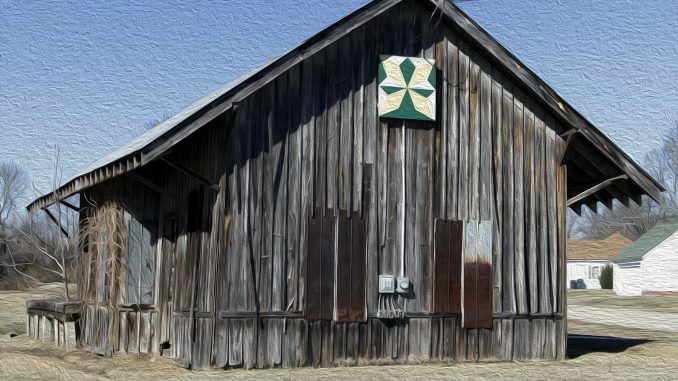 The Franklin County Arts Council (FCAC) captures the history of the area through the display of quilt blocks on historic buildings and structures in Franklin and surrounding counties. What began as a Franklin County endeavor has spread east to Martin County. FCAC’s plan is to install quilt blocks along the route of the Tar River all the way to Beaufort County — where the Tar River empties into Pamlico Sound. The Quilt Trails map available from FCAC, and recently updated with new quilt blocks to see, shows where these ornate wooden blocks may be found. Maps are broken down into the Roanoke River Trail and the Tar River Trail. Along the latter, one of the communities visitors will find is Bunn, North Carolina. This charming little farming community of approximately 350 citizens celebrated its 100-year anniversary in 2013 with an official kick-off of the “Quilt Trails of the Tar River” held at this depot. The block design was chosen to celebrate this anniversary. In 1913 the town was incorporated and a railroad, with the depot, was built to serve mainly the Montgomery Lumber Company business. Soon, however, the railroad was serving other businesses and carrying passengers. The town bustled with activities and new businesses common to that time period: a blacksmith, general contractor, carpenter, timber men, a general store, auto repair shop, and railroad employees. Ice was brought in by the railroad and a planning and grist mill were built in the area. Neal and Ann Brantley (brother and sister), who grew up in Bunn remember that the train whistle could be heard far off and children ran to meet and wave at the train. Sometimes the engineer would throw candy to the children and the children enjoyed talking with the engineer when the train stopped. They remember coal cars, flat cars, and box cars, parked and left to unload for several days. The children would play around the cars and run over mounds of hay, gravel, and sand that had been mounded for projects. It was a time when electricity was not widely available, roads were impassable, and travel had just become a new concept thanks to the railroad. Quilt blocks continue to be installed, with new locations added each year. For those with property along the Tar or Roanoke River basins, who are interested in hosting a quilt block, see frequently asked questions and contact information here. Howe’s Your Pizza: the Howe family pizzeria (website here). Rainbow Garden: lengthy menu plus specials and quick service. Sisters Cafe: a family restaurant offering country cooking, with some local ingredients, in a welcoming environment (on Facebook here). The Farmers Kitchen: offering country-style breakfasts and lunches in the center of town (on Facebook here). Subway: locally-owned fast food location. Coming in the near future is a new restaurant, Rustic Roots, which will be a farm-to-table, pay-what-you-can-afford restaurant created by Vollmer Farm. Bunn is also home to a Food Lion location. While Bunn does not have a hotel or motel, there are farms in the area that offer a farm stay or vacation rental, including the Ray Family Farms farm stay. While the address is Louisburg NC, this farm is close to Bunn town limits. COMING NEXT: The Quilt Trail articles will continue every few weeks, so come back and visit The Grey Area News to learn about other towns and cities along the Quilt Trails of the Tar and Roanoke Rivers.